I have now placed my school tie back into its draw, most likely for another year. However, here is a tongue-in-cheek account of my tradition. I don’t want anyone thinking this is some modern nostalgia! Therefore, lest you should think it…. the whole (more serious) point of this, is that the tradition has not just occurred now that I have become Norwegian, but has been constantly in use since (at least) 1988. It hath long been my custom (as I bare witness herein in mine aforementioned posts) to take up the colours of our school at Adwick in Doncaster, whensoever certain occasions have presented themselves. Which tradition hath furthermore continued long after those hallowed buildings ever were occupied by an alien entity, and verily now after they in these latter days have been destroyéd by the same. And whereas (and lest) the minds of some slanderous folks should perchance question my motivation, that peradventure this be a mere vain invention of more recent times, it hath pleased me to go diligently unto mine archives for to prove what long standing my said tradition most surely hath. And from these mine earliest times in Norway, I did take away my facial hair in 1994… pictured showing my resignation from my position on the island of Hitra. Ye that truly and earnestly make examination of the above picture shall be able to make out my first logo, that preceded that ye now see above my work, which I used from the year of Our Lord 1990 – until 2012. And so it was that in October 1994 I played for my last service in Nordbotn Chapel, on the island of Fjeldværøya, and there did give a farewell concert unto the residents thereof. Afterwards they presented unto me their tributes, with flowers and good wishes. And thus I departed those parts, and came hither, unto this Arctic abode of Lødingen. Now in those days there was a military fort in these parts, and exceeding greater opportunities for employment. Unknown occasion 1995. Music room Lødingen High School. And thus I began my service in Lødingen – both as organist and music teacher. Ye see me here even in the classroom. As for the occasion that surely did merit this tie I now wot not. It suffice to say that I have only ever used the tie for special happenings, and this must therefore have been one of such. These were the first days I therefore platyed the organ in Lødingen, and at that time I should also travel to the nethermost parts of this great land to entertain others in concert…. So it was that, that same first Summer, I went on a tour in Trøndelag and in Møre and Romsdal. And it was from this time that the School Tie became a part of my concert routine. Before it had only been used at Yule. The concert at Rindal. Summer 1994. 2005 in Bergen, after Adwick School had ceased to exist. Now I remember putting upon me this Tie in the year of Our Lord 2000, but two years later our old school was deposéd by a new. And all that which we once knew – which by then had waned so greatly that I had foreseen the end as early as 2000 (and had written in that year a great chronicle concerning the decline thereof) was finally lost to history. Peradventure I failed to observe the Tie tradition in 2002, knowing our Rome was sacked. Yet ere the new Empire of Wakefield laid claim unto its land, I restored the traditions in memory of yore! Here ye see me before I left Bergen in 2005! Now this is the account of my Tie tradition, for those that would say it be a modern invention now that I have joined the Viking tribes, and made myself as one of them. Forsooth I say the Tie tradition goeth long way back, even unto my time as a student at Huddersfield. Even from there did this begin! And not even the great Arctic Organist himself hath ought quite like unto Þe Olde School Tie Tradition of mine that hath so greatly influenced the making of my Yorkshire Viking Norway Blog! Some photographs capture something “more”. On the face of it, this is but a picture of some trees. For us who went there, however, it is the grave of Adwick School. Here stood our senior wing. There is a wistfull atmosphere. Black and white amplifies this. That maybe entirely subjective, but I am not the only one to pick up on it. There is something “more” to this picture than meets the eye. Trying to define this something “more” is like chasing a rainbow. The moment you approach it, it moves further away from you. Yet I am not speaking of associations that only we who came here can know about; there is something more, that makes even those who didn’t, to describe it as “haunting”. For me (qualifying therefore what I write precisely with feedback on my earlier post both from people who did know what used be here and those who have absolutely no personal association with the place) this is both unsettling and very beautiful all at the same time. “Haunting” would therefore be a fitting description. I have recently received some pictures not only of what used to be here (and off camera in the likewise demolished main building further up to the right), but from our world and time that long have passed. Unfortunately I cannot post these, because they are not for further publication. However, I can tell you they are no less poignant. Most of these pictures are in black and white. Yet that seems to highlight any associations one actually might have. I do not even notice the absense of colour: that something “more” seems to allow my brain to “see” what is not there! I find myself transported backwards in time. Once our uniform was very smart and characteristic. Before its lamentable decline in the nineties it was very strictly enforced. As I see my uniform thus again, it is as though I am standing there among those pictured. It is so incredibly “virtual” an experience – to use a modern expression. Yet again the black and white picture but re-enforces this experience! I am utterly captivated by the photography. This was the world I knew! Yet I cannot bear it too long. That something “more” is unsettling as well. It is a world that has forever gone. With respect to the hauntingly beautiful, yet eerie picture shown above, we are looking at a graveyard. What now is but some trees and grass, was once our childhood world alas! 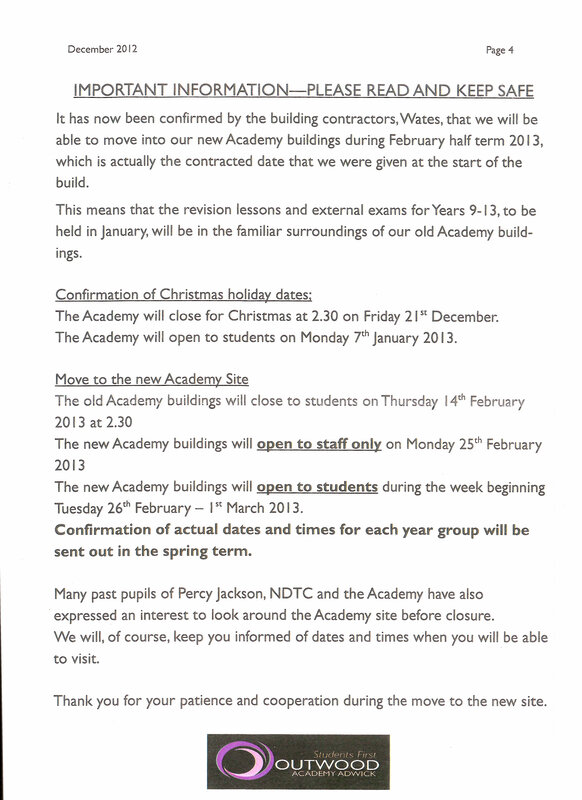 Adwick Academy publishes the dates of its big move. I wish them well. One of my contacts was kind enough to send me this information letter from our successor school, Adwick Academy. If you go to the Academy’s own website, you will see the official countdown to the New Academy – which for those of us who went to Adwick School (NDTC and Percy Jackson) means that that is when our old school is finally disused. I thought that this were happening over Christmas. Clearly I got that wrong. Nevertheless, I do not intend adding more to the Adwick School section now. If anyone sends me pictures of the demolition in progress, then of course I shall post these – but the game is well over now, and I have drawn a line over it. Perhaps I’m being a grumpy old man, but I thought it was interesting that Adwick Academy refer to ex pupils of Percy Jackson and the NDTC, but do not mention Adwick School at all! Maybe there is nothing in this, but with some of the negative comments I found on the Internet last year…. it sort of makes me wonder. Whilst I shall not be adding any further to the Adwick section, you will remember that this blog was temporarily shut down for one day in December. That was when I thought that this big move were beginning. When the academy’s official countdown reaches 0, which by my reckoning is midnight Monday 25th February, this blog shall mark the confirmed end of Adwick School by doing the same as it did in December (GMT). On Monday 25th February, only one page will show if you come here. There will be one picture of the old Adwick School in black and white, and the blog itself will revert to monochrome. Normal service shall resume midnight Tuesday 26th February. Please note that the “Adwick School” item on the main menu will also be removed after Easter. No material will be deleted, but you will then have to use the archive to access the Adwick posts. These have already been archived anyway. “I will drown and nobody shall save me” – reported of someone drowning in a lake. The man, like so many others these days, had not learnt the “shall” and “will” rule! Finally, you will perhaps have seen that I’m a bit picky about words. I don’t like the modern custom of calling school children “students” – it’s interesting that the academy refers to us oldies as “past pupils”, but calls its own children “students” – but apart from this, I distinguish between “will” and “shall”. You should too. We are losing so many fine distinctions in the English language. I wonder what will be so special for today’s pupils if they go into higher education, and become students? Yes, I know that this is American usage, but I think that we just end up losing a very fine nuance in English. Now there will be nothing special about one’s status as a student any more. ‘Tis a good thing I emigrated…. I cannot tell you how strange it feels. Yesterday I received photographs from Saturday’s tour of Adwick School, and today I was sent more from a former pupil of the even older Percy Jackson Grammar School. As I meditated upon the beauty of the Polar Night here, I tried to take in these wistful reminders of my childhood whilst juxtaposing the thought that EXACTLY thirty-three years ago, I was starting my very first day there. Old Adwick School now. 33 years ago, Monday 10th December 1979 this was where I was starting a new school. Now these buildings are worn out and coming down in the New Year. In fact this is more than juxtaposition in time. I’m now over here in Norway, and these events – both then and now – are way over the sea in England. Nevertheless I also feel a strange satisfaction in doing what I am. I have read many a spiteful comment about Adwick this last year, and feel that someone ought to point out that whatever its difficulties at its end, it was once highly respected. Someone has got to cover its end in a fitting way. So my blog and I are like a kind of satellite, now with very little connection to the land that originally launched it, orbiting above and separated by a huge distance – yet transmitting a message that more should broadcast terrestrially. Fortunately I know that I am not entirely alone, though. 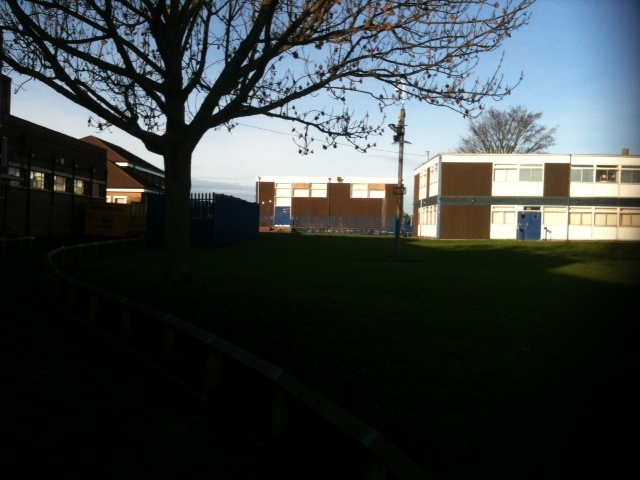 After all none of the pictures I have of Adwick School these last days were taken by me! It may be ironic that a blog based in Norway has taken on this task (for that no one else has done so), but it is fitting that that very irony demonstrates the once great name our school once had. Indeed there are former pupils living all over the world. One should also include those who went to the Percy Jackson Grammar School that preceded Adwick School. These people have been very active with reunions, and are a truly international bunch. We have perhaps differing views about the demolition of our former school, and the rebuild; but we are nevertheless united by our respect for where we grew up. Whatever our personal views, we do not rejoice at our school’s demise. What has saddened me in the last year, then, has been to hear what I can only describe as contempt, on the part of certain people who still live in the vicinity, for what is and always will be a part of their own history. It saddens me that for these, it is also incredible that anyone should wish to mark the end…. yet in truth, they have never appreciated the worth of what now is lost. I would rather not end this on a negative note. Therefore let me leave my point concerning those who have come with harsh words with the following observation. With the exception of one person whom I know personally, and who had a very difficult time at school, most of the comments I have read – on Facebook and similar sites on the Internet – come from relatively younger people. We are all aware of the problems the school faced in its final decade, before ceasing to be Adwick School. Yet let not that generation speak for mine! United in a wish to honour the past, and paying their last respects to our old school. Former pupils of the Percy Jackson Grammar School and Adwick School outside its historic main building this Saturday. 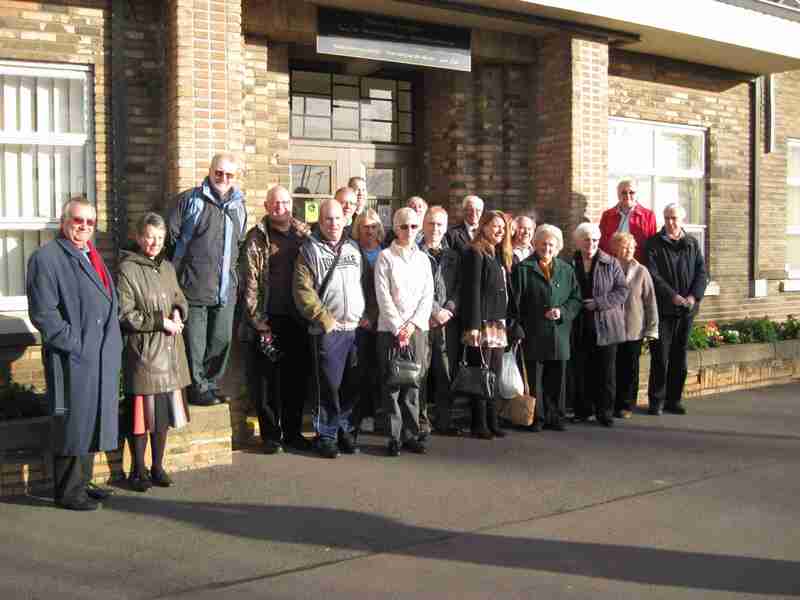 A great thank you to Janet Roberts for sending the group photograph. So now we enter the very last days for what was our school, what was our childhood, and indeed what we for some time have been mentally preparing ourselves for. Seeing the photographs my friends have sent – I shall publish more (I already have permission for most of them) – I nevertheless can see that our old lady has become tired. The buildings, especially the old senior wing further down from the Percy Jackson building photographed here, show their age; and a certain melancholy pervades all the pictures I have seen. Thank you everybody who has sent pictures to me. I wish especially to thank Janet Roberts for this wonderful group photograph. I have taken the liberty of posting it, but naturally I shall withdraw it if you would rather I do so. Adwick, there are many who have not forgotten thee! Yesterday I felt a bit like someone working at a space agency. They’ll spend a fortune on electronic wizardry, send this up to some distant world – and then on the day that it arrives wait with increasing tension for the first pictures. Yesterday two of my school friends returned to Adwick School. They had promised to take a lot of pictures, and to send them to me. Here at mission control (cleverly disguised as a three year old laptop) I awaited the first pictures from my school. I was not disappointed. Yet it was a “bitter sweet” confirmation of what I have been writing about. One of my school friends had earlier remarked “if those walls could talk” when hearing about the decision to demolish our school. Thanks to Deborah Grace and Jill Jenkins, I was able to see places that I last saw over thirty one years ago at the age of sixteen. For all that I love the power of language, nothing can prepare you for seeing such images. As precious as I found them, they were equally unsettling. This really freaked me out. The last time I stood here was in 1981, when I was sixteen years of age. The image that really sent shivers down my spine was this one. 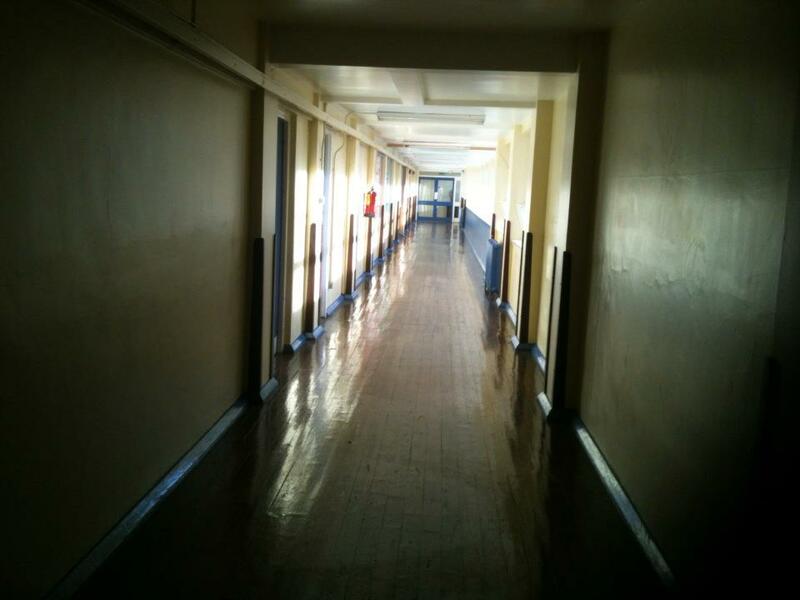 It is of a corridor on the top floor of the main school building. Looking at this is really “bitter sweet”. The picture firstly disturbs me because this is not the childhood world that (we are feeling that) we have lost and are looking back upon when we visit the school. As I tried to say in my first poem, and article about the demolition of our school, that is lost in time and not in space. Therefore though you could “return”, you can never return, even if you stand in the exact place you left. This picture is therefore a little unsettling. There is a sinister foreboding to all the images. This is not my childhood world – it is its empty shell. The picture above is nothing like, and yet exactly like my walk into school early in the morning. In those days you would come in from Windmill Balk Lane, and you would walk pass this point. Yet that was then. This is different – somehow. I am sorry if that sounds a bit like the “Saphire and Steel” science fiction series of the late seventies and eighties (I watched that as a schoolboy), but there is something quite spooky about the old school. In an earlier generation, people would use one word beginning with “h” for what I am describing. Now that would be regarded as superstitious. So let it suffice to say that there is a certain oppressiveness to the place that cannot be conducive to education. You certainly don’t need to look to the supernatural to explain it. The architecture of the school represents a different time as well, and expresses different ideals about society. Thus while my late father commented in 2001, that that place could not have had a coat of paint on it since I was at school, the “corridor” illustrates there is a limit to what you can do even if you had have spent a lot of money on it. It would still be that (by today’s standards) claustrophobic passage, and the classrooms would still fundamentally be those designed for the “top – down” approach to education where everybody passively sat in neat rows. This of course is a strong argument in favour of the rebuild. On the other hand perhaps an objective explanation for the “dark” feeling cannot be found, and I have no intention here on speculating what else might lay behind it. For me it is enough that this is only the shell of where I spent my childhood. I want to remember my Adwick School as a very different place. Seeing it as it is now makes me feel that perhaps it is best for everybody that our alma mater now rest in peace. This was where we waited for the bus home at the end of school. It used to open out on to a field. Now it is boxed in. Thirty-three years ago EXACTLY, on Sunday 9th December 1979, I was all exited and ready to go into Adwick School for my very first school day. At the end of that day, on Monday 10th December 1979, we queued up in this playground – which then opened up on to a wide field. Now it is completely “boxed in” by the new school buildings. Then I was happy and exited to be at my new place of education; now it is different, and whilst I still could have wished I could have attended yesterday’s tour, I think meeting my old friends would have been the high point. This place pictured is just “different”. Since it is the anniversary day tomorrow, I’ll end this fairly long post here, and continue on the same theme for my next post. Thank you for the photographs Jill and Deborah. Of course Adwick School was firmly on my mind today. My friends from school would be paying their last respects, and just as their tour of the condemned buildings began I took myself out on to the beach at Vestbygd. A year ago, I had photographed brilliant colours coming to this place. This year there was so much cloud that black and white had to do. Perhaps the weather only reflected the sombreness of the occasion in England. Norwegian Time is one hour ahead of English time, so this picture was taken while the tour of my school was going on. It is an odd thing that – of all the places – I should end up back here. 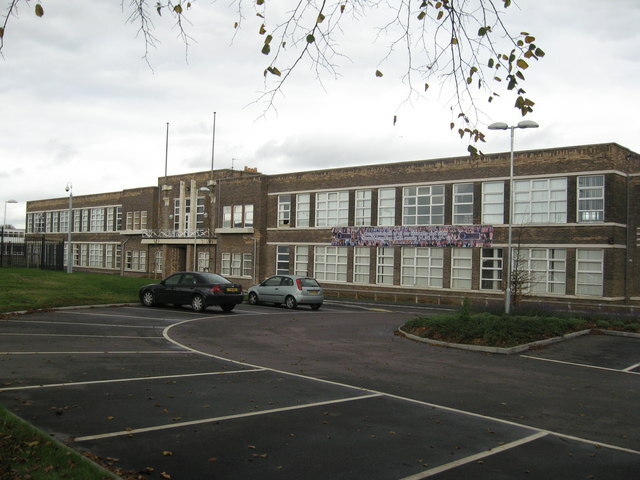 Vestbygd School, which is itself threatened with demolition, is the one school in Norway with a connection to Adwick School. Back in 1997, when I worked in this municipality before, I had travelled to Adwick School with two of the pupils from Vestbygd. They had enrolled half a day there, and one of them even used my old school tie! The darkness is upon us. The Polar Night has come. 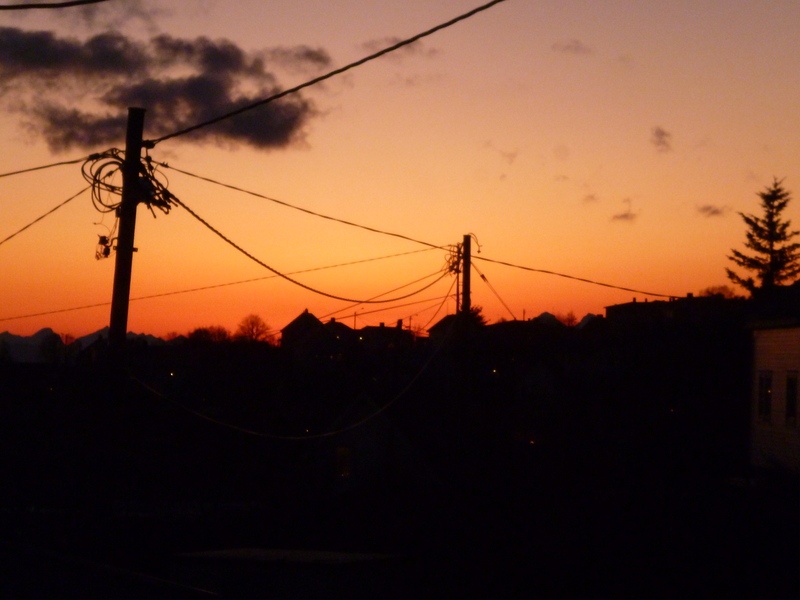 Contemplation (Daily Photo) on Wednesday 5th December. With beauty like this, I reflected upon what I was doing exactly thirty three years ago on this day. Yesterday (4th December) had been an exciting day. I was going to Adwick! We had won our fight against the school authorities. For a whole month, my parents had pulled me out of Don Valley High School – as they had over a year previously. Then they had failed to get me transferred to Adwick School. Now they had succeeded. My uniform, which we had bought after our meeting with the headmaster, now lay ready downstairs in the dining room. I could not wait to put it on. Yet my first day wasn’t until Monday. In the meantime tonight was choir practice at Woodlands Church, as it was every Wednesday. Just before I went there – I just had to celebrate and show them! – I sneaked on my Adwick School tie, and left the house for the church. And notice! Yes they did. I was now going to the same school those singing in the choir went to. I was now also one of them! Alas for thee, O Adwick! Yesterday I received an e-post from a former pupil of the Percy Jackson Grammar School (which was the earlier name of Adwick School). I was informed that this Saturday my old school will be putting on a tour of its premisses – the last chance for those who went there to see where they grew up. During the Christmas holidays, the present academy will move out of the premisses and into its new buildings – and the older school buildings will all be demolished. There is a Christmas Market and tour of the ‘Old School’ – the Former Percy Jackson Grammar School/Adwick School on Saturday 8th December 2012. The market begins at 10am and ends at 3pm and the tour starts at 12 noon – assemble in the reception area. This, as you may know, will be the last chance for many of us to visit our former school before it will be demolished next year. 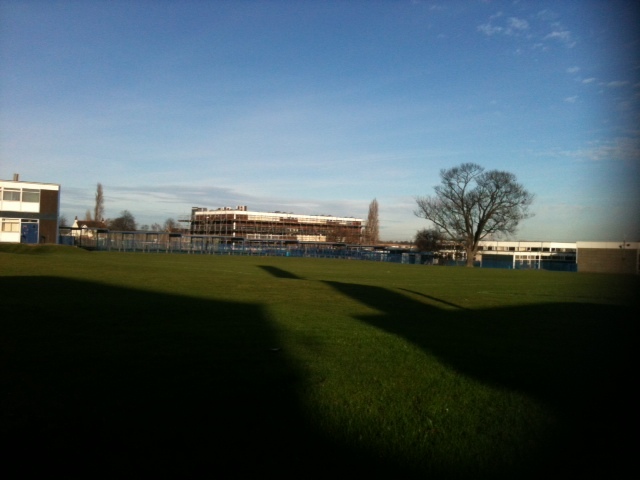 The new building for Outwood Academy, Adwick will be completed very soon and their use for the old buildings ended. They plan to move during the Christmas holidays – e-mail from former pupil. Of course I should have liked to have gone. Unfortunately it is completely out of the question. Even if my economy allowed for a jaunt back to the United Kingdom (which it does not), I have other engagements this weekend. Nevertheless my heart will be there, and I have friends who are going. They have promised to take pictures. If they permit me to, I shall post some on this blog. The former Adwick School now to be demolished. As I have maintained since the rebuild became known, although I do not oppose it – I think the new facilities are a great thing for today’s children – I will not be sending up the rockets the day the bulldozers move in. Some apparently feel differently. However, I think they are making a mistake. Whatever the failings of our teachers (I have a friend whose memories of school and Adwick in particular are not indescribably happy ones), our formative years are just that: they remain a part of us, and speaking for myself Adwick School will therefore remain a part of me. On the other hand, I realize that it went from a school with a very good reputation, to one with serious problems, and I cannot speak for those who came after my generation…. one of whom has said that he would like to press the button the day it comes down! I still think that this marks the end of an epoch, and as such we should observe it with quiet dignity. Even if I think that they have done the right thing building new, it is still a sad day to lose the last seat of childhood authority. Therefore as we now approach this end, Adwick School unashamedly comes to the fore of this blog. On this day, the fourth December 1979, my parents and I met the headmaster Mr Atherfold in the morning, and it was agreed that I should be transferred there. I remember that there was a system of coloured lights outside his room, saying when he was busy and when you could go in! In the afternoon my father took me to Cliffs in Doncaster, where I was fitted out with my Adwick School uniform. I was to start school the following Monday, 10th December. It seems a little strange that these dates fall exactly with the days this year, thirty three years later, just before it all comes to an end. I should like to thank those who have promised to take pictures for me. Not everyone feels as comfortable with writing as I do, but words for visiting an old school just before it is demolished will always be found wanting. How do you express your feelings? When you see that place that once was “up there”, now very much at your own level? When what was strange and new is familiar, old and worn out? When that room you feared to approach is now just a mundane place? So thank you to those who are going Saturday. I cannot exactly say enjoy yourselves, but I do hope that you will find the tour meaningful. In my previous post about the final countdown to Adwick School’s last day in use, I noted that everything of our school apart from one solitary building nearest Tenter Balk Lane should be demolished. This is not true. Every building that was part of the old Adwick School shall go. I am currently studying the eight page long (and really quite verbose) planning document, whereby the condition that the academy should have to reinstate the playing fields – is recommended discharged. 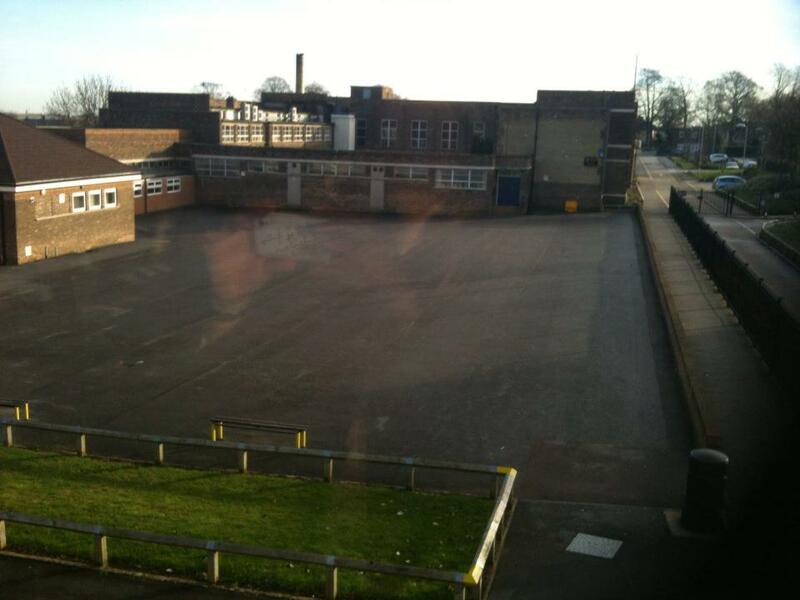 It is clear from this that for us who went to Adwick, the entire school shall be demolished.